Get Fresh Foot Care is a botanical-based lemongrass feet products slough, buff and moisturize, providing instant relief for tattered tootsies. Formulated without parabens, sodium lauryl/laureth sulfates or synthetic dyes. I love products for me feet, because a lot of companies focus on the face, hair, body etc. No one cares about their fee anymore? Relief for Tattered Tootsies Kit($23) is a 3-step foot treatment that sloughs, buffs and moisturizes with skin renewing botanicals and lemongrass for instant relief. This kit is better then a spa treatment! After being on your feet all day, nothing is better then a nice warm bath, and this foot treatment. The bag is also adorable, makes for a great makeup bag once your products are gone. Get Fresh sells products by fragrance, which was my favorite feature on their site. You can choose from black currant, grapefruit, starfruit, lemongrass, orange blossom or white fleurs. Grapefruit, however is one of my favorite fragrances of all time, so I couldn't resist! The Grapefruit Hydrating Body Butter ($27) is jam-packed with an exotic mix of antioxidants, botanicals, multivitamins, and tropical nut oils. This whipped creme wonder absorbs quickly, is never greasy, and leaves your skin supple and noticeably softer. I love the delicious smell of grapefruit, and this lotion really delivers. The scent is long lasting, and will keep your skin moisturized through out the day. Check out this adorable set by Get Fresh. The Look Better Naked Grapefruit Set. ($29.80) The 3-step home spa treatment is specially formulated to combat dull, dry and lackluster skin. 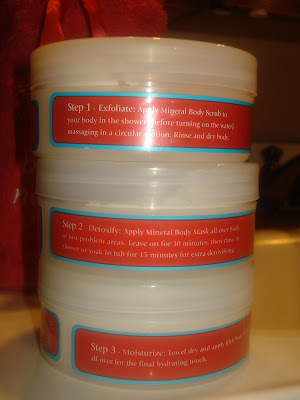 In just 15 minutes, it exfoliates, detoxifies and moisturizes to help your skin look its best. The first step is the Mineral Body Scrub. Apply it on, works like an exfoliator, and then wash it off to get rid of all that yucky dead skin on your body. The 2nd step was the Mineral body mask I've never actually used a body mask, it was quite interesting. It's like a face mask but all over your body! So I let that sit for about 15 minutes, and then washed off. The Result? My Skin was soft and smooth, just like your mud face mask! And the 3rd step is a Rich Body Creme Doesn't feel like a regular lotion, it's a little bit thinner, but I actually liked that because it went on smooth and soft. Works just like a face mask, but for your entire body!!!! Get Fresh makes for a great gift, or keep it for yourself. I can't speak for the other scents, but this is one of the best smelling grapefruit products I've smelled and tried in a LONG time. Visit Get Fresh for all your bath and body needs. You will love the result ..